Japanese tea bowl (Chawan), white, bone china, 200ml, 9 x 6 cm. The medium-sized Japanese porcelain tea bowl in elegant white is perfectly suitable for enjoying Japanese green tea or any other type of tea. The common, medium size of this tea bowl fits the everyday tea consumtion just as well as tea samplings or all kinds of tea rounds. Japanese tea cup (Chawan), blue-grey, 100ml. The small Japanese ceramic tea bowl with artful blue and grey color pattern is perfectly suitable for the enjoyment of Japanese green tea or any other type of tea. The small size of this tea cup is particularly beneficial for delimiting caffeine intake per cup or to fit tea samplings or larger tea rounds with limited teapot capacity. Japanese Tea Cup Set ‘Takeo’ (Yunomi), 150 ml/cup, Japanese ceramics, different designs. The set, consisting of 5 different beautiful designs, is perfectly suitable for serving all Japanese green teas or any other type of tea. 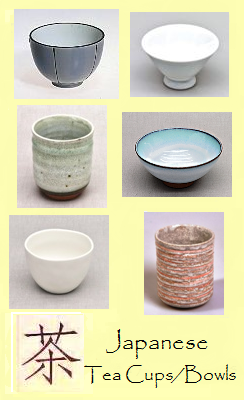 The relatively common size makes it fit for the everyday private tea drinking alone or in groups, while the artful Japanese designs and the unique curved shape are a safe eyecatcher at any dedicated event or casual social gathering. Japanese Tea Cup Set ‘Zen’ (Yunomi), 150 ml/cup, Japanese ceramics, different designs. The set’, consisting of 5 different beautiful designs, is perfectly suitable for serving all Japanese green teas or any other type of tea. The relatively common size makes it fit for the everyday private tea drinking alone or in groups, while the artful Japanese designs and the unique curved shape are a safe eyecatcher at any dedicated event or casual social gathering. Japanese teacup (Chawan), bone china, white, 120ml, 7,5 x 5,2 cm. The Japanese porcelain tea bowl in elegant white color with individual form design is perfectly suitable for the enjoyment of Japanese green tea or any other type of tea. The relatively small size is particularly beneficial for delimiting caffeine intake per cup or to fit tea samplings or larger tea rounds with limited teapot capacity. Japanese teacup (Chawan), white and turqoise, 210ml, 11.5 x 5.5 cm. he medium-sized Japanese porcelain tea bowl in elegant white is perfectly suitable for enjoying Japanese green tea or any other type of tea. The common, medium size of this tea bowl fits the everyday tea consumtion just as well as tea samplings or all kinds of tea rounds. Due to the adequate size and shape of this Japanese teacup, it can also be used to prepare and drink Matcha tea. Japanese teacup (Chawan), white, 100ml, 8.2 x 5 cm. The small Japanese ceramic tea bowl in elegant white is perfectly suitable for the enjoyment of Japanese green tea or any other type of tea. The small size is particularly beneficial for delimiting caffeine intake per cup or to fit tea samplings or larger tea rounds with limited teapot capacity. Japanese tea mug /cup (Yunomi), coral/grey, 200ml. The Japanese ceramic tea mug in appealing coral / grey color pattern is perfectly suitable for the enjoyment of Japanese green teas or any other type of tea. The relatively common size and shape make it particularly fit for the everyday private tea drinking alone or in groups or as an attractive eyecatcher at special events or occasions.